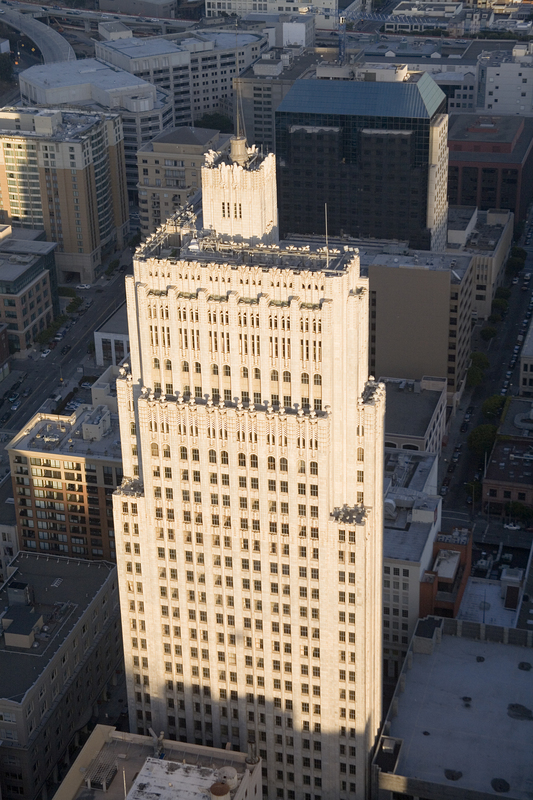 For those of us in the minority who like the building, which was designed by Timothy Pflueger, Arthur Brown Jr. and John Donovan, and completed in 1939, it was not a pretty sight. I tried to be stoic, thinking about Richard Nickel, the architectural photographer and preservationist who witnessed more demolitions of Louis Sullivan buildings than salvations. In addition to his photographs of the buildings, he also salvaged ornament from their wreckage, until he died inside the Chicago Stock Exchange, when a wall collapsed on him, in part because the buliding was so weakened by the water sprayed during the demolition. It was fascinating and disturbing at the same time to see the guts of the building spewing forth and many spectators had the same ghoulish fascination with watching something being wrecked. 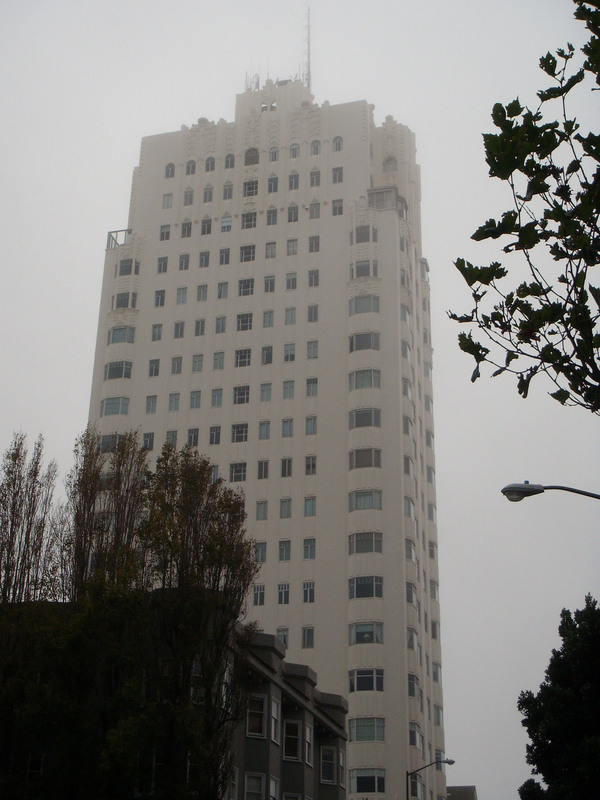 But it was still hard to see, especially knowing that the building was one of the more modern works of two of the city’s well-known architects of their eras, Pflueger and Brown. 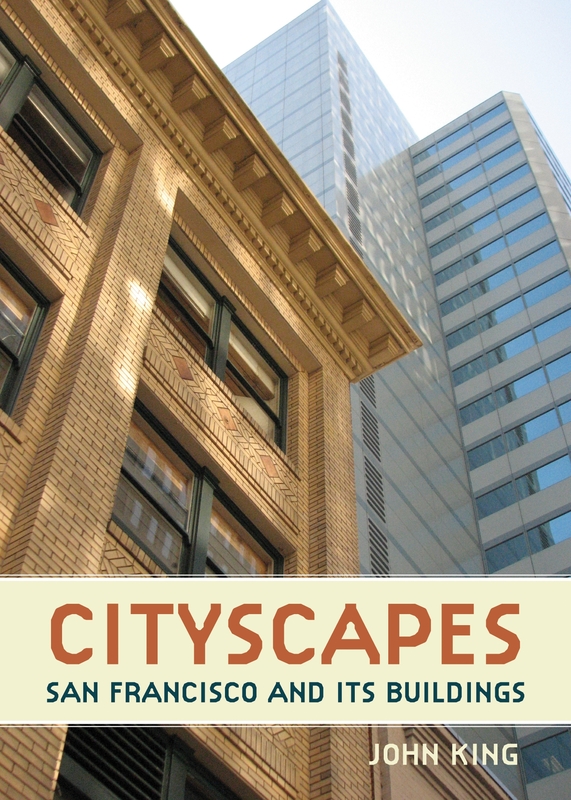 Fortunately, much of their work is extant in San Francisco, but this also made the demolition of the Bauhaus-inspired building harder to watch. The act of tearing down a building brings a lot of pollution into the air and it was shocking that none of the wreckers seemed to be wearing masks. 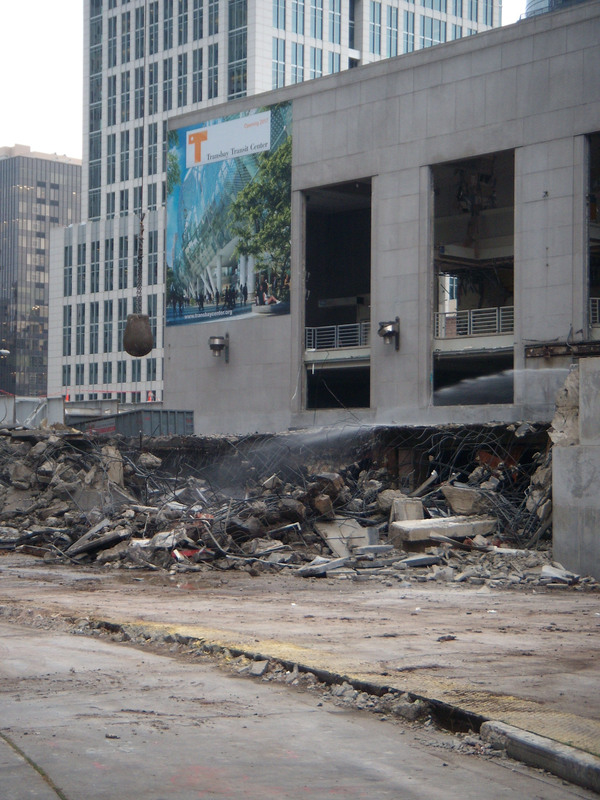 They have, as all demolition sites do, someone spraying water after the wrecking ball makes contact with its target, to control the dust and building particles flying through the air. The one interesting thing is that it’s not gone in one full swoop of the ball: it’s a long, tedious, rather monotonous swinging of the ball, until it breaks the concrete or granite. The windows have been torn out, and hopefully some of them have been preserved somewhere, along with the wooden benches inside and some other fixtures. (Please see older post with some photos). The 1930s lettering is gone and hopefully preserved. A wrecker told me that the facade won’t get hit with the wrecking ball until next week sometime. I was not the only one who was sad to see the building go. I talked to a few people gathered around, some taking photographs. Many others were also sad, and talked about family memories associated with the terminal. One 62-year-old photographer even remembered taking the train, the Key System, across the Bay Bridge. Some, though, did talk about its usefulness as a modern train station and its current unkempt state. But it seems to me that no one really gave the building a chance to play a role in the new design. 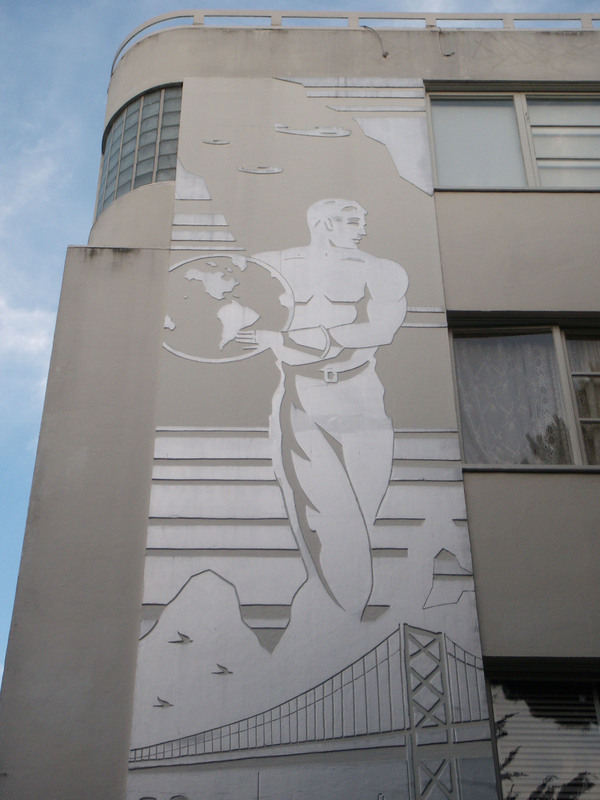 San Francisco may be famous for its Victorian row houses and over-the-top Queen Annes, but it is also home to one of the most notable examples of a building in the Streamline Moderne style. 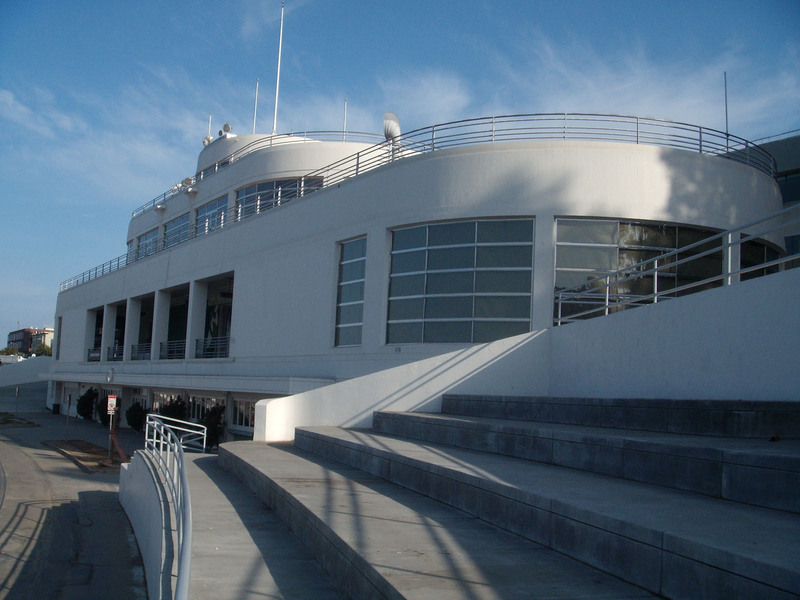 The ship-like Bathhouse building, which sits in its berth at Aquatic Park is a great example of the style, which became more popular in the 1930s, and often features nautical references. As the Great Depression went on, the concept of streamlining, creating clean, sleek lines seemed more in tune with the austere times. But it wasn’t just the economy, there were other influences too, such as Norman Bel Geddes and his industrial designs meant to evoke movement and speed. 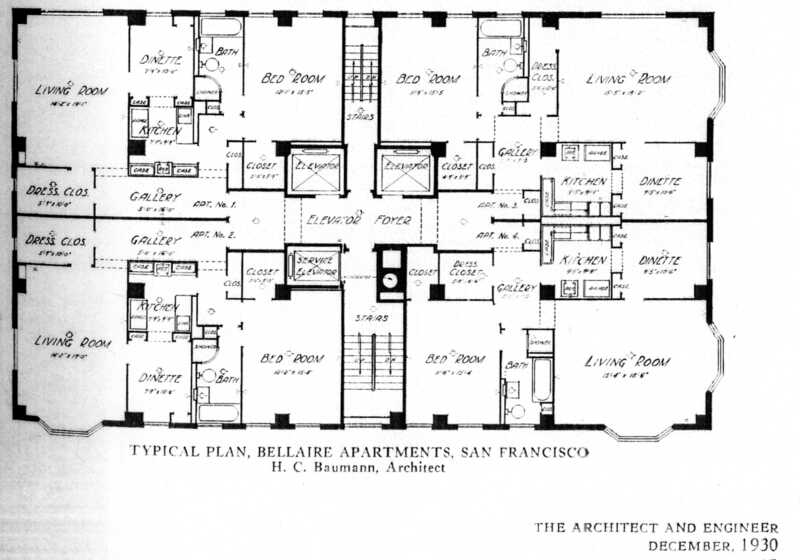 There was also a growing influence of the European architects who espoused a sparer form of modernism, dubbed the International Style, and many of them moved to the U.S. to teach or work. The Aquatic Park bleachers and Bathhouse, now the Maritime Museum and operated by the National Park Service have been undergoing a major $13.8 million rehab project over the last year, the bulk of which is now finished. The bleachers, some of which had to be demolished and others rebuilt, were finished this summer and reopened to the public, and the restoration of the stunning murals in the Bathhouse lobby is now complete. The building is an architectural feast for the eyes for anyone enamoured with this period of design, and it contains a treasure trove of public art. Originally designed as a public bathhouse, beach and playground at the sea, Aquatic Park also includes an 1800 foot curving pier. It survives as an example of both a triumph and a travail of the city and the Works Progress Administration. 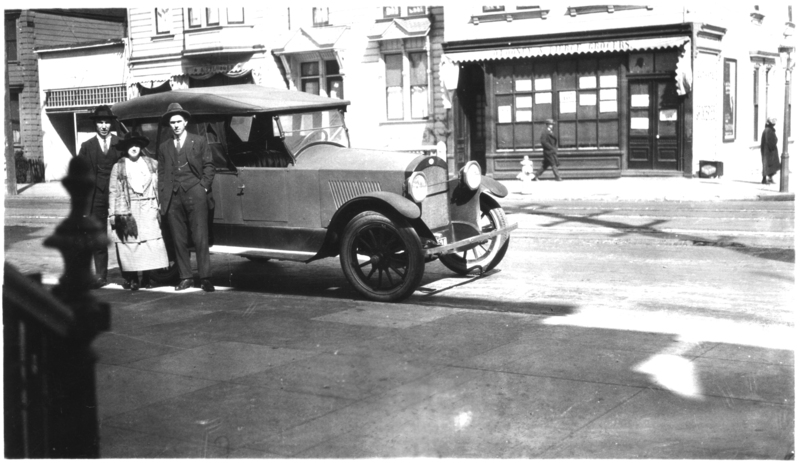 In 1917, the city bought the land at the bottom of Van Ness from the Southern Pacific Railroad, but legal technicalities held up the work. 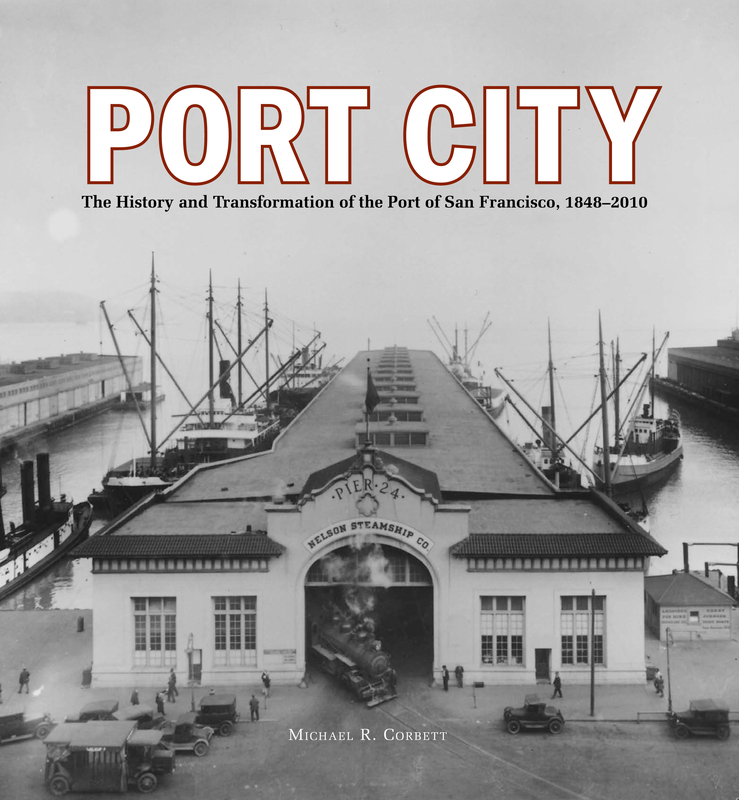 Construction first began in 1931 on the combination breakwater and pier, by a private construction firm, working for the city’s Parks Commission. The project, however, languished. After the election of President Franklin Delano Roosevelt, much of the work moved to the WPA, which began work on the seawall in December, 1935. 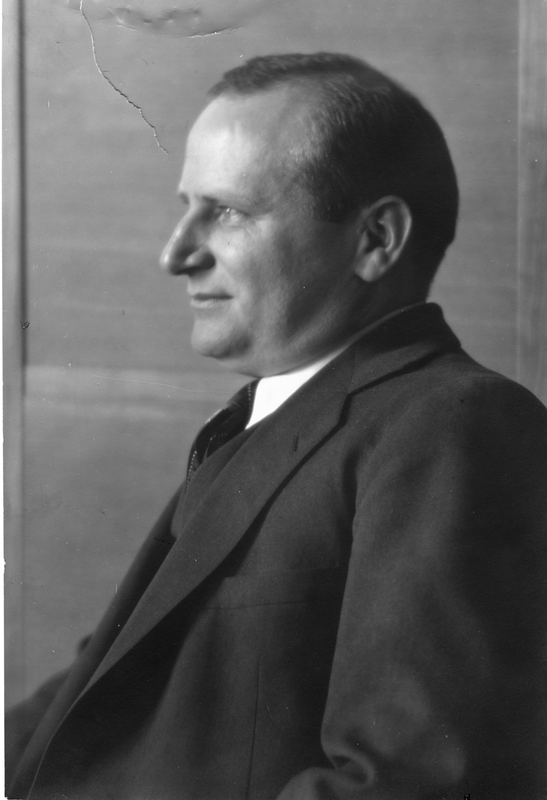 Architect William Mooser III of the city’s Mooser architectural dynasty, designed the bathhouse as assistant district director of the WPA. The project, which cost $1.2 million, finally opened in January, 1939, after much public grumbling. 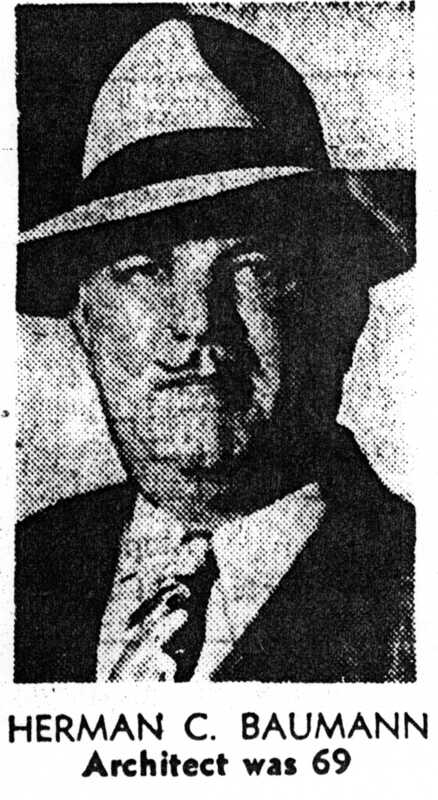 The San Francisco Chronicle tried to calm the city in an editorial on July 24, 1936. 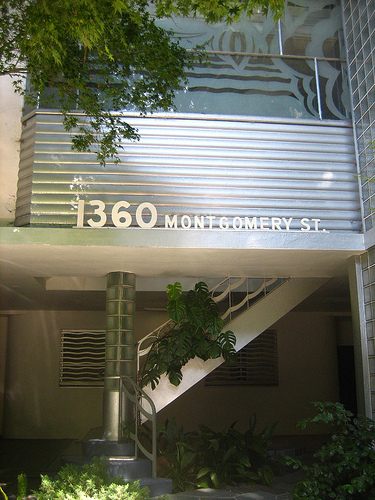 “It is quite natural for the public to become impatient with the progress of public works…The difficulty is accentuated when construction projects are undertaken by such governmental organizations as WPA.” Five months after the opening, the WPA was called back in, and built a sewage pumping plant, a playground, convenience stations and added stainless steel around the plate glass windows and doors. The building’s flat roofs and terraces were the root cause of its water damage and need for the lengthy repairs, but it was worth the wait. The murals have also been cleaned and restored. 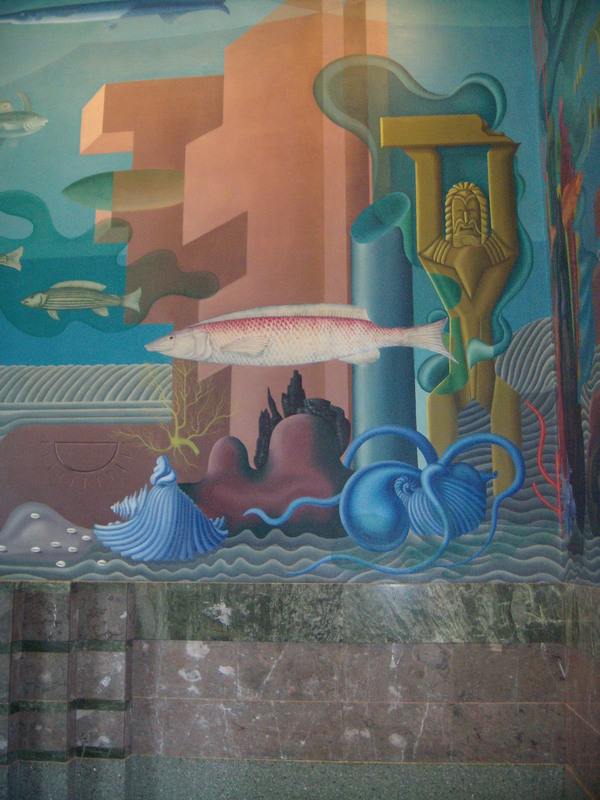 On the first floor, the colorful walls depict an underwater world like Atlantis painted by artist Hilaire Hiler, who created 5,000 square feet of submerged continents and mythical sea creatures. 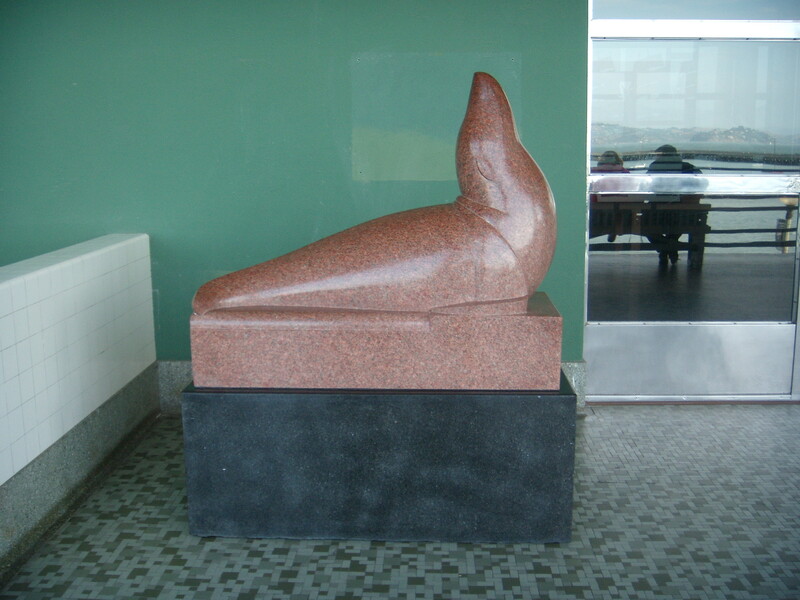 Just outside on the terrace, beyond the plate glass doors that mirror the bay, there is more art. 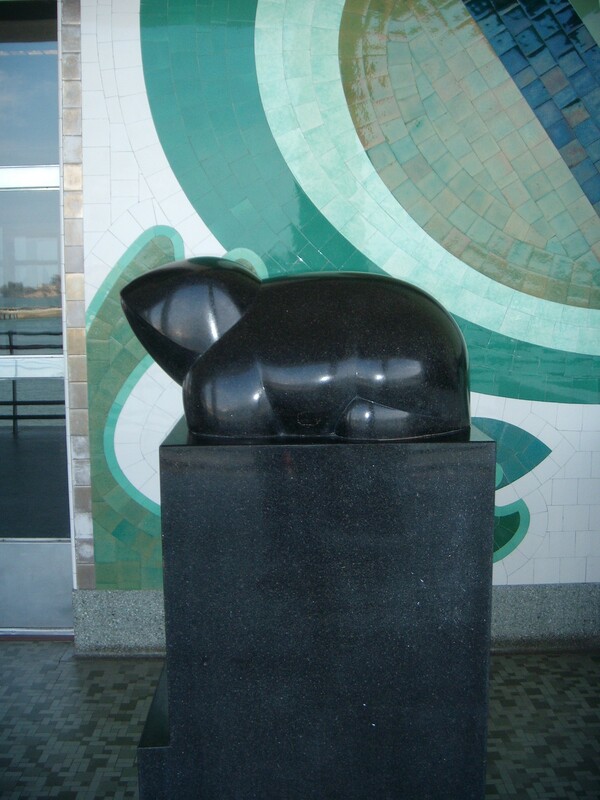 San Francisco sculptor Beniamino Bufano carved a seal and a frog in his round, inviting forms. Artist Sargent Johnson, who also worked with architect Timothy Pflueger on the athletic frieze at George Washington High School – where he replaced Bufano who was fired – did some unusual tile mosaics in the same manner as mosaics in Islamic mosques. 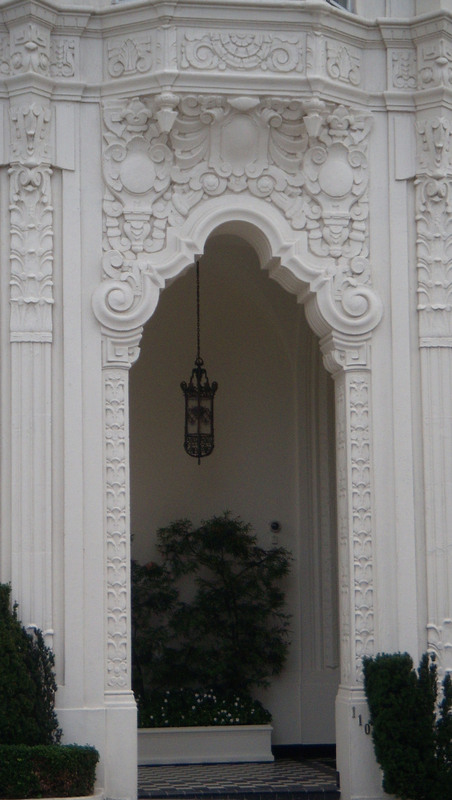 Johnson also sculpted the slate that surrounds the entrance to the Bathhouse building. 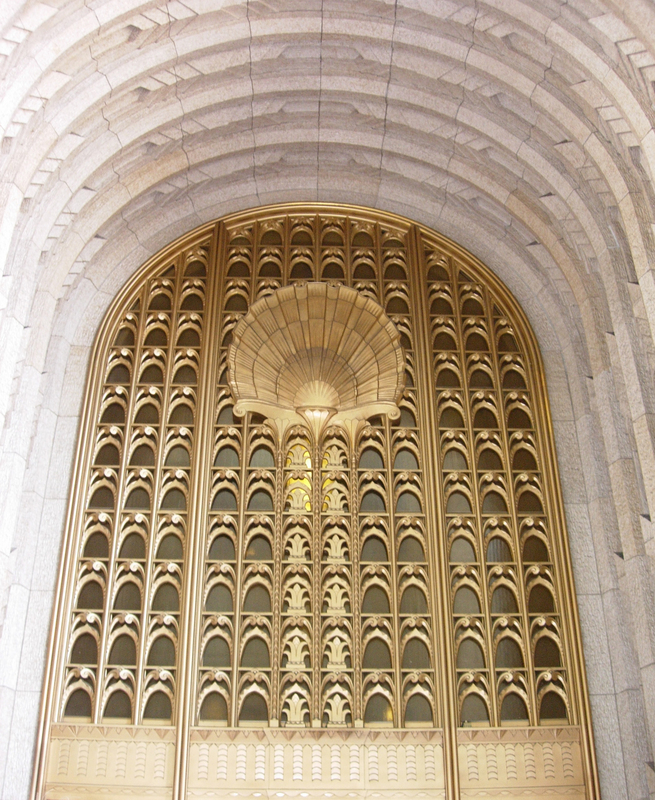 Johnson said in an oral history with the Smithsonian Institution’s Archives of American Art that he wasn’t quite sure what the subject matter of the facade was. “It has something to do with the waterfront somewhere, boats – I don’t really know. I just carved the thing,” he said. 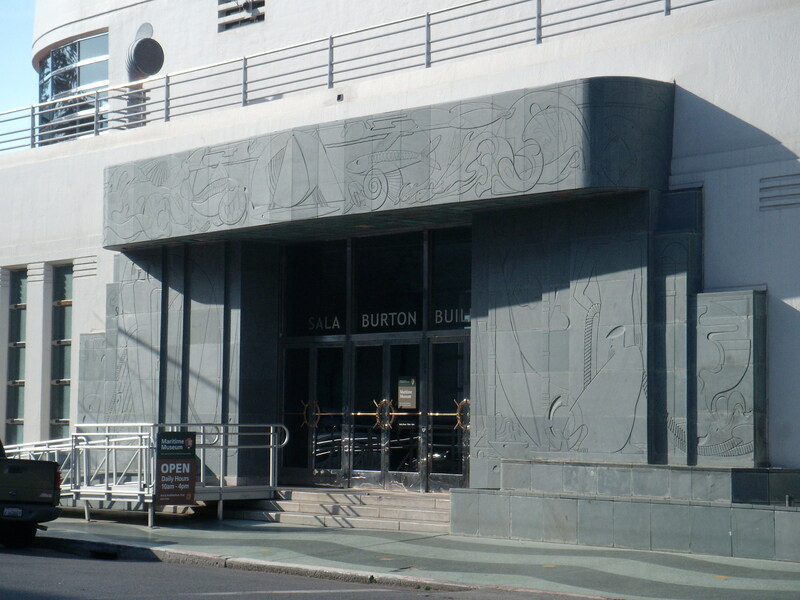 At the time of the interview, which took place in 1964, Johnson, who was 76, and Mary McChesney, who conducted the interview, discussed how the murals in the Bathhouse were peeling, water was coming down the walls and they were rotting. They would be pleased to see the restoration today. The last remaining part of the restoration project, which is still awaiting funding, is to repair the plaster damage to the second floor, so that area is still closed to visitors. When that work is complete, the Maritime Museum will reopen its exhibition space. A ranger from the Park Service conducts a daily tour at 3 pm to discuss the art and architecture of the building, with the exception of this weekend, because of the Blue Angels flying overhead. I will be talking about the Aquatic Park project in my lecture Monday at the SF AIA, as part of its “Rediscover the City” series. It’s definitely worth a visit and the National Park Service gets kudos for finally taking care of this jewel of a building and its art. Friday afternoon, just under two thousand people showed up at the Transbay Terminal for several tours and a sad farewell before it closes for good next week. 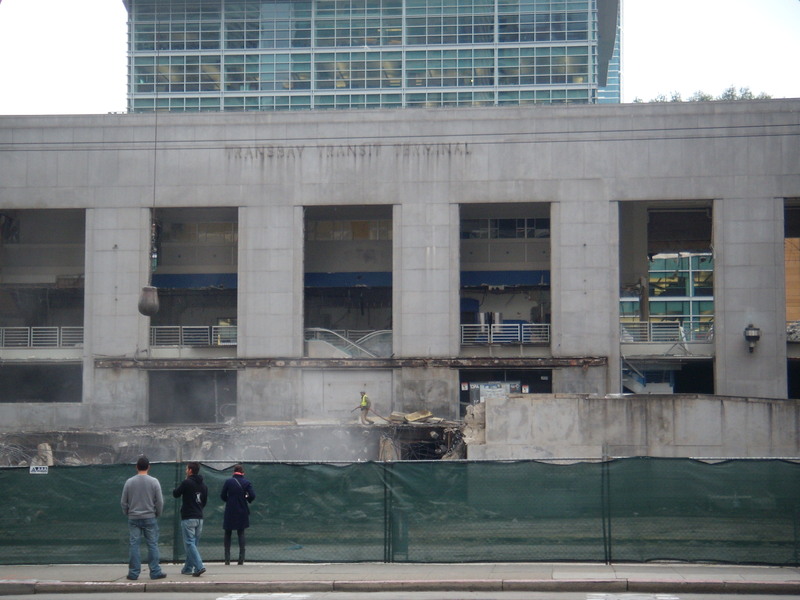 The Transbay Joint Powers Authority and Caltrans did some last-minute sprucing up and managed to get most of the homeless people out of the terminal for a round of one hour tours through the building and some of its rarely seen nooks and crannies. In a bizarre outpouring of sudden affection for the building that has been neglected for years, garbage cans were seen being spray painted, the small terminal jail got a coat of white paint, and the terrazzo floors were being polished, according to one eye-witness on Thursday. The series of tours began at noon and lasted until the end of the day, with the crowds getting bigger at the end of the day when they had to split the final 4 pm tour into four groups. 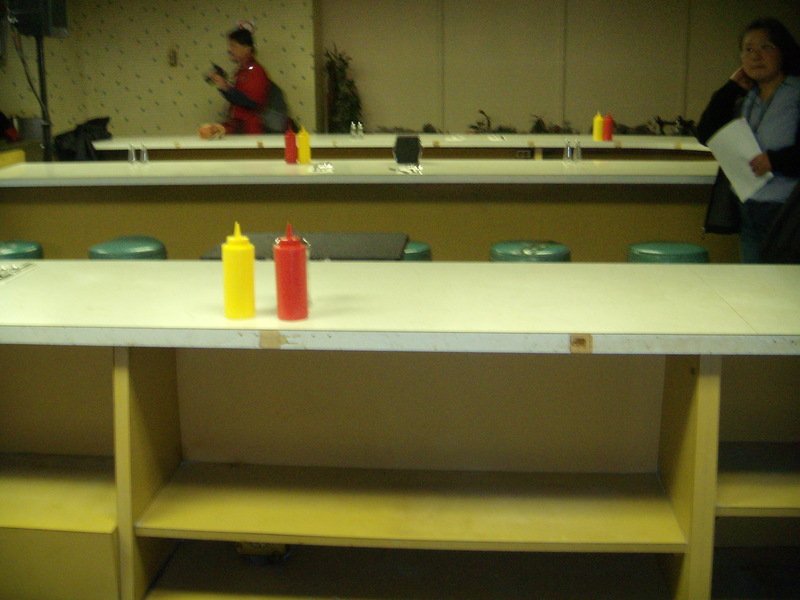 One of the highlights of the tour was the Cuddles Bar, which has been closed since the 1990s. You can see in this photo the low ceilings from the ground floor that everyone griped about, but still, this bar has some touches of architect Timothy Pflueger, working with a very low budget. The bar had been cleaned up and martini glasses put along the bar, which like some of his other bars, such as the bar in the Cirque Room at the Fairmont Hotel, had a long, serpentine shape. 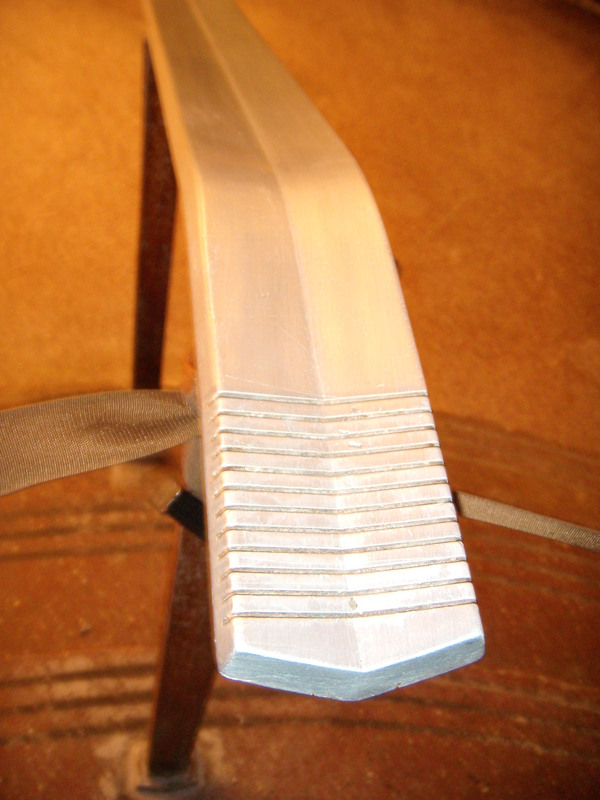 The little set of steps used to get into the bar added a touch of elegance and the brass aluminum staircase railing almost evokes a cobra. 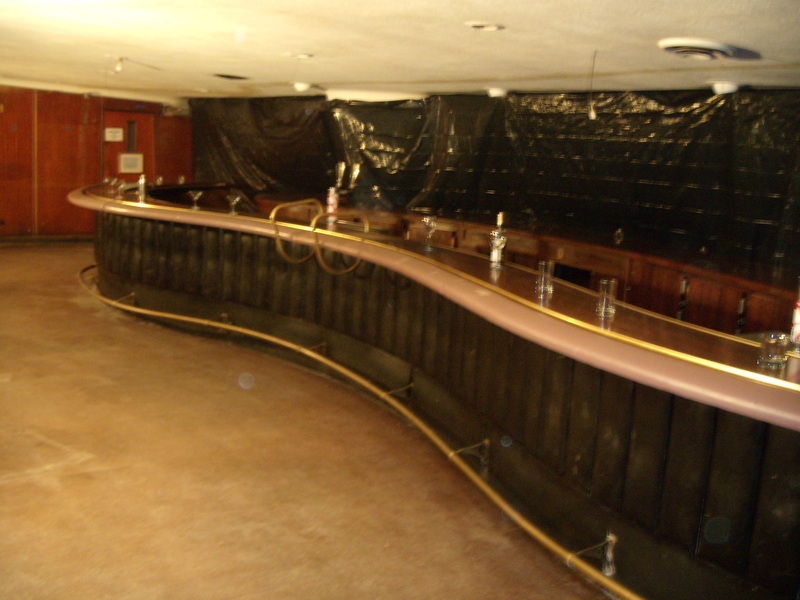 A guide said the Cuddles Bar was the first state facility to serve alcohol (probably after Prohibition). 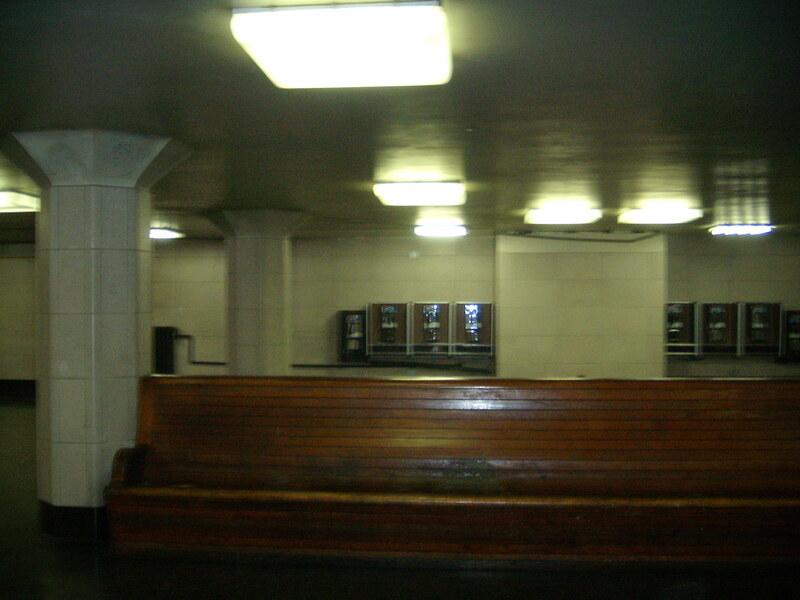 Right next to the bar, with its own passthrough, was a Harvey’s Diner, part of the Harvey House chain of railroad station restaurants, which boomed in the heyday of rail travel. There was also a shoeshine station, operated by just two people in its entire existence, Roy’s Barber Shop and other concessions that have been long-shuttered. Many people brought cameras to record the Terminal’s final days, but as you can see the photos show how dreary the interiors look now, and its main grand space, the main hall is vastly changed, chopped up by the added escalators and bus ticketing areas. 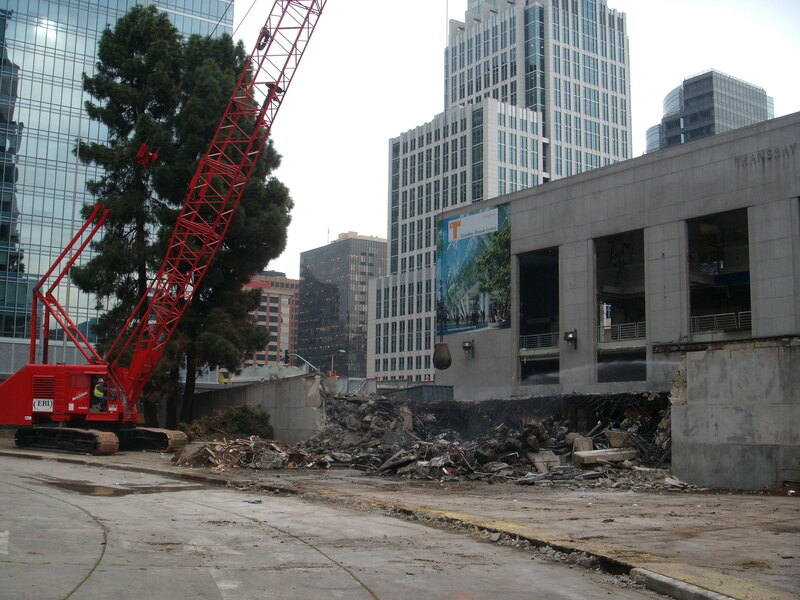 UPDATE: For better photos, our friends at Curbed SF found this set by Databong on Flickr. Among a few interesting factoids learned on the tour was that a scene from the movie, “The Bachelor,” based on a Buster Keaton film, was filmed using the main staircase of the terminal, where a group of wanna-be brides chased the main character, played by actor Chris O’Donnell. 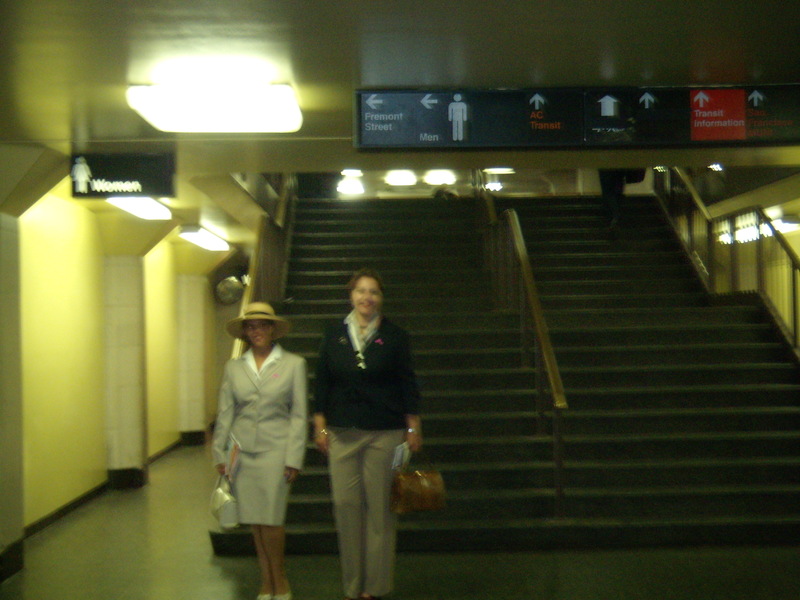 On our San Francisco City Guides Downtown Deco Tour, we mention another movie, “The Pursuit of Happyness,” [sic] where the homeless protagonist, played by Will Smith slept with his son in a supposed BART station, which was really the Transbay Terminal waiting room. Here is a shot of the grand staircase, that now leads up to the bus platforms. We could see (perhaps not that clear from the photo) Pflueger’s penchant for elegant staircase railings. A Caltrans employee told us that some of the items of interest, such as the comfortable wooden benches, the shoeshine boxes, the staircase balusters, at least one of the massive windows, and other artifacts, will be saved for a transportation museum. After completing the tour, architectural historian and researcher extraordinaire Gary Goss told me he now sees that the city is in need of a new terminal. “We need a new terminal for the 21st century that is pedestrian friendly and not a homeless shelter.” Even though Caltrans does not allow homeless people to live in the terminal, at least 60 people have called the terminal home. There is also a homeless outreach station inside. The city has spent the last week getting them out of the building, with Mayor Gavin Newsom making a visit, talking to some of the homeless to try and get them into a shelter, as the Chronicle reported. 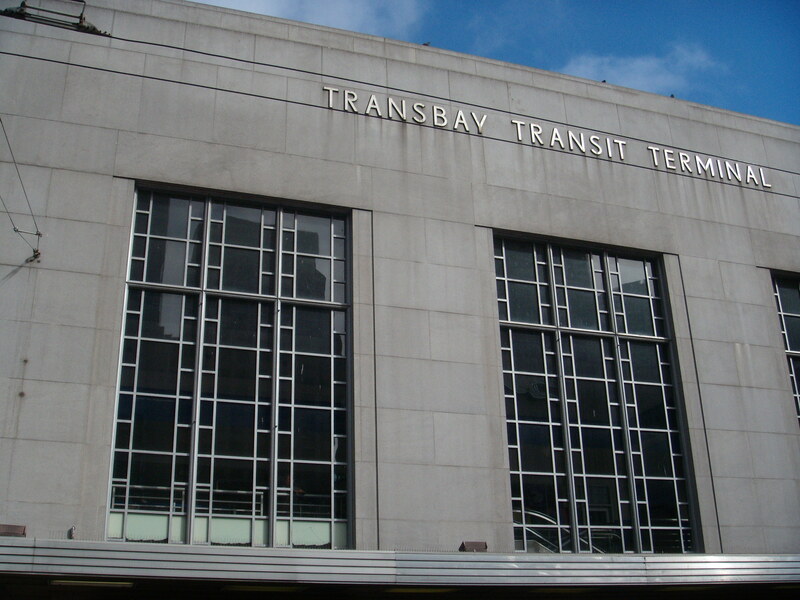 As the Curbed SF Blog has noted, the Transbay was “not always usless, ugly, old and smelly.” I hope the transit museum effort happens, and that it can save some fonder memories of the much-maligned building.